"Sir Archibald, fifth baronet of the first (1776) creation and third baronet of the second creation (1819), succeeded to these baronetcies on the death of his father, the late Sir Charles Edward Hamilton, in 1915. 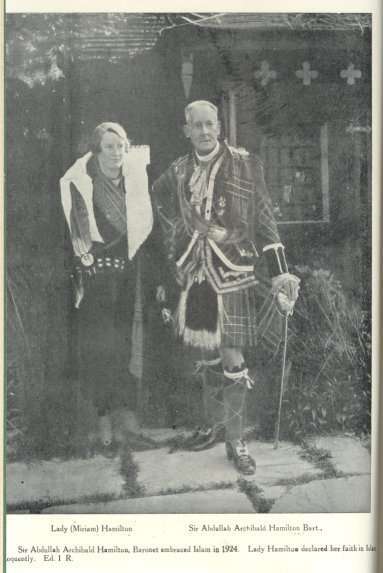 He married (first) in 1897, Olga, only daughter of Rear-Admiral Sir Adolphus Fitzgeorge, K.C.V.O., and granddaughter of Field-Marshal H.R.H. the late Duke of Cambridge, first cousin to Queen Victoria; and (second) in 1906, Algosta Marjorie Blanch. ... He had one son from his first wife, who was born in 1898, at whose baptism his late Majesty King George and Queen Mary attended in person as sponsors, and who died in action as a Lieutenant in the Grenadier Guards in Flanders in 1918. On the death of his second wife in 1927, Sir Archibald married for the third time, and this is the present Lady Hamilton who survives him. Sir Archibald was a descendant of William Hamilton, one of the six Kentish petitioners, brother of Sir James Hamilton of Donalton, direct ancestor of the Duke of Abercorn, and also Baron Hamilton of Paisley, who married Mary, daughter of King James II of Scotland. Sir Archibald embraced Islam in 1924 and had since been an ardent preacher of the faith. The sad news reached the (Woking) Mosque on the morning of the 18th (March 1939), and the Imam went down to Selsey to arrange, in consultation with Lady Hamilton, for the obsequies. The following Tuesday, he went down again, accompanied by the secretary and two other helpers, to attend to the ritual washing and shrouding. This done, the body lay in state till the morning of Thursday, the 23rd, when it was brought by motor car to the Brookwood Muslim Cemetery. The mournful procession arrived at the cemetery at 12.30 p.m. The Imam, with other workers of the Mosque and distinguished members of the Muslim Community, had already arrived there. The Salat al-Janaza was offered in the midst of solemn silence, the relations and friends of the deceased participating. The body was lowered amidst the suppressed mourning of all at about a quarter to one. His grave lies by the side of another and older stalwart of English Islam, the late lamented Al-Haj Lord Headley al-Farooq. They were great friends in life and close comrades-in-arms in the cause of Islam. It was in the fitness of things that in death also they should lie together. May Allah shower His mercy on their valiant souls and make them an inspiration for those who survive them." 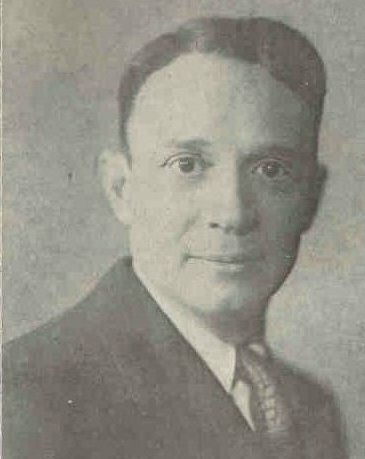 From the Islamic Review, February 1935. 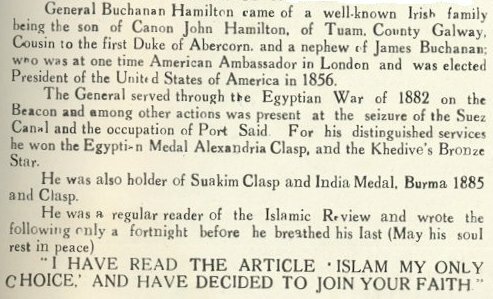 Lady Buchanan-Hamilton: A woman convert, also buried at Brookwood, is Lady Khalida Buchanan-Hamilton, President of the British Muslim Society of the time. 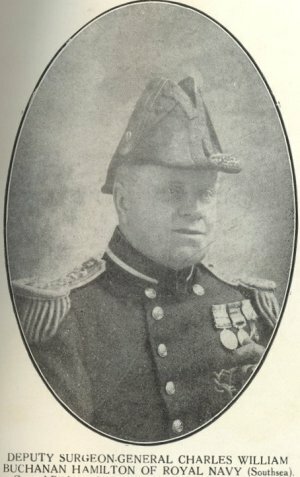 She was the wife of Deputy Inspector General Charles William Buchanan-Hamilton, referred to above. Declared his faith in Islam in January 1922. Conducted the Id-ul-Adha prayers at Woking on 16 April 1932, reciting whole of Sura Al-Rahman in the first raka and last part of Sura Al-Munafiqun in the second raka. 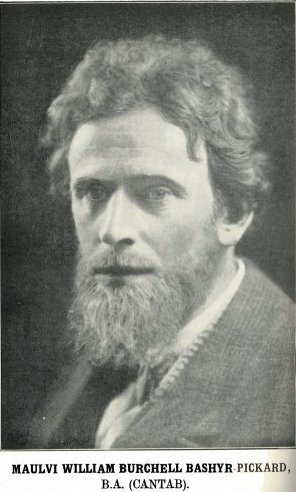 From the Islamic Review, August 1932. Born in Illinois, U.S.A., completed his studies at the Universities of Washington and Columbia, where he won many scholastic honours. Poet, literary critic, author, and editor-in-chief of Radio Personalities. Wrote Beyond the Brim and Bazar of Dreams. From the Islamic Review, April 1935.